Your email brings such pleasure. l have been away from VT for many years, but I will always be a Vermonter at heart. Thank you for sharing your talent and view of the many beautiful places in my home state. 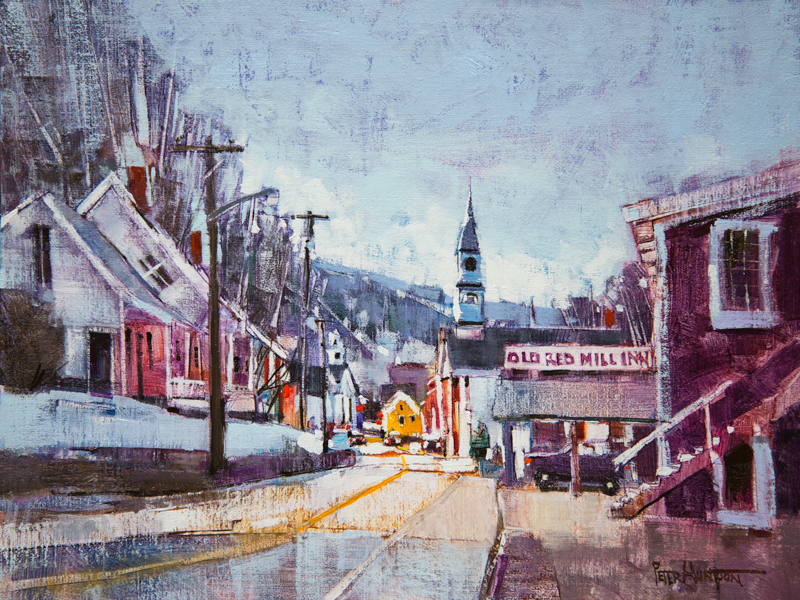 Have you any watercolors of Waterbury Circle? I don’t Cathey, sorry. I will add it to my long list of possibilities however. Thanks! Thank you Steve, this one started with a nice transparent underpainting of higher chroma color. I love that cool/warm contrast this time of year. Love it, thank you! 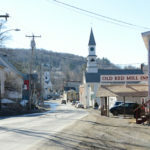 Wilmington is a quaint little town which is just over the mountain from Bennington where I live. The curves and the uphills and downhills are breathtaking at times but such a beautiful trip! The town itself is adorable with many places to visit and some excellent places to eat. 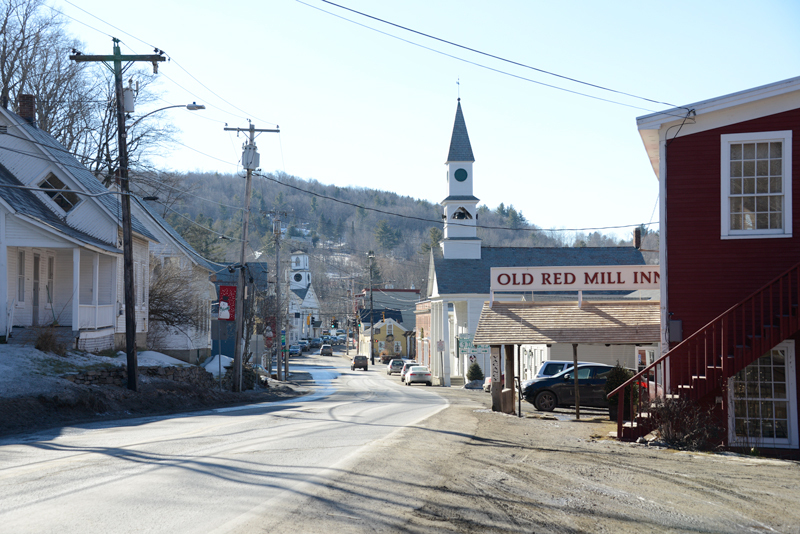 A wonderful little Vermont town! I hurried through town for this painting, but have made a note to return and explore further, for all the reasons you list. Thanks Vivian! Some paintings, and thoughts, are better than others for sure, Deanie. Thank you! Love the handle “lazy window” for those windows tilted in above another roofline. Thanks Cynthia, there is still snow here where I live, and in fact I’m about to start next Mondays painting today. Hint: It will have snow. The best paintings do come, no doubt, from “a more personal place”. Colors, values, compositions come in virtually infinite variety and combination, but I personally feel that it is mainly from the artist’s deepest self that the art work can evolve beyond a simple picture and mature to become a message of greater truths , speaking to the heart and soul. Indeed Brian, the best paintings seem to paint themselves, as if the self conscious ego is bypassed and a direct conduit to some inner truth is connected. If only we could tap into at will. It seems to come and go of it’s own accord…but I have found that the harder and longer I work, the more often it flows. I agree with you, Peter. The most important push for painting is the flow. The “thing” has to catch your mind and your hand. The other important factor is your technique. It allows you to be a fast painter. And at last: You are not afraid of the efforts, the hints of wheather and lonely places. Greetings from sunny Duisburg. So nice…love the details, the splashes of color, etc….I can look & linger on this painting for the longest time! Do you give summer workshops? Not currently Gloria, at least not in an official or formal way. Maybe someday. I have been taking time off from teaching to explore my own path in earnest. If you want to visit my studio and chat for a bit, happy to do that. So fresh, so spontaneous. You remind me a little of Utrillo, and also one of the Bucks Count impressionists, Walter Baum. Thank you Gloria! I’ll have to go check them out. Loved this picture! I am curious: with what color did you experiment? I think the pictures of the small towns are my favorite! Splashes of gray are always so soothing and of course, they remind me of Puget Sound, in Washington state. Thank you for sharing your talents. Thanks Janet! I almost always have one new color on the palette I’m testing. If I use it a lot, it might stay and/or replace another one I don’t use much. Beyond color (hue), each tube has it’s own characteristics such a body, opacity, mixing behavior, dry time, etc. These more subtle nuances become ever more important the longer you paint. Thank you for sharing this beautiful painting. My pleasure Karen, thank you!